February export data showed improvement, but there is still a long way to go to balance production with domestic consumption and exports. 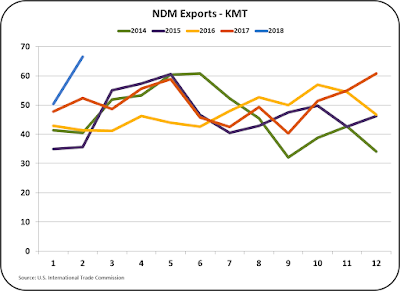 Exports of Nonfat Dry Milk/Skimmed Milk Powder (NDM/SMP) were especially strong with a gain of 28% over the prior month. This was a huge increase considering the existing strong export levels of NDM/SMP. Imports of NDM/SMP were down 7%. 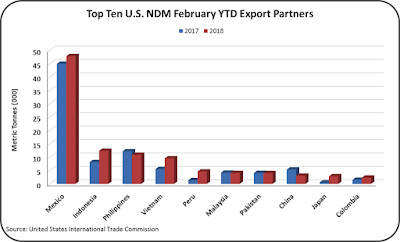 This helped create an all-time record for net exports of NDM/SMP. Exchange rates have not shifted much recently and remain significantly favorable for exports compared to year ago rates. 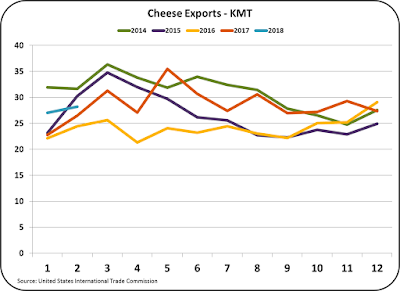 Cheese exports were better than last month, better than last year, and better than the year before (Chart I). However, there is still a desperate need for even higher levels of cheese exports. 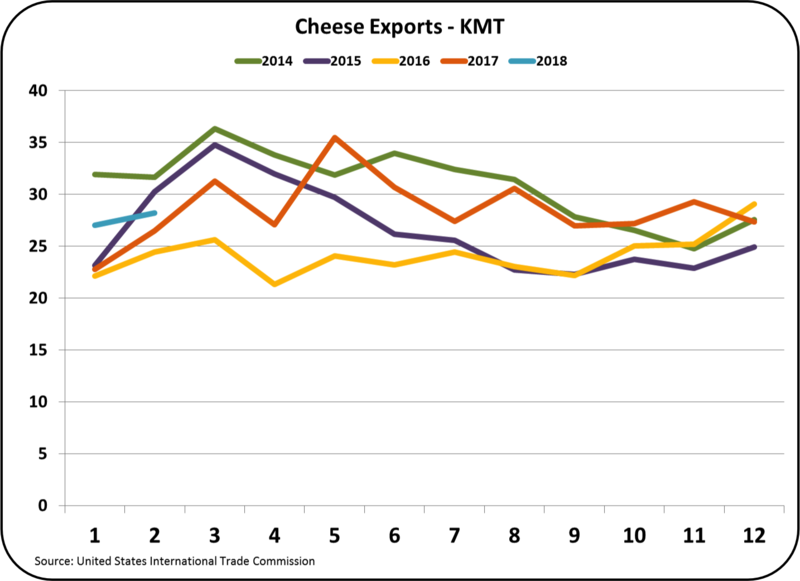 February exports were still well below 2014 and 2015 levels and cheese inventories are still very high (See Prior Post). 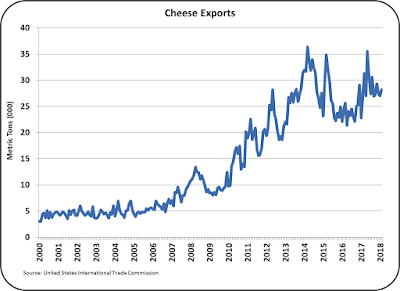 To put this into perspective, Chart II shows cheese exports from 2000 to February 2018. The chart shows rapid growth for the ten-year period from 2004 to 2014. In 2015, cheese exports struggled and in 2016 they fell back to 2013 levels. In 2017 there was strong March data, but then exports fell again. The improvements to date since then have been mostly positive, but minimal. 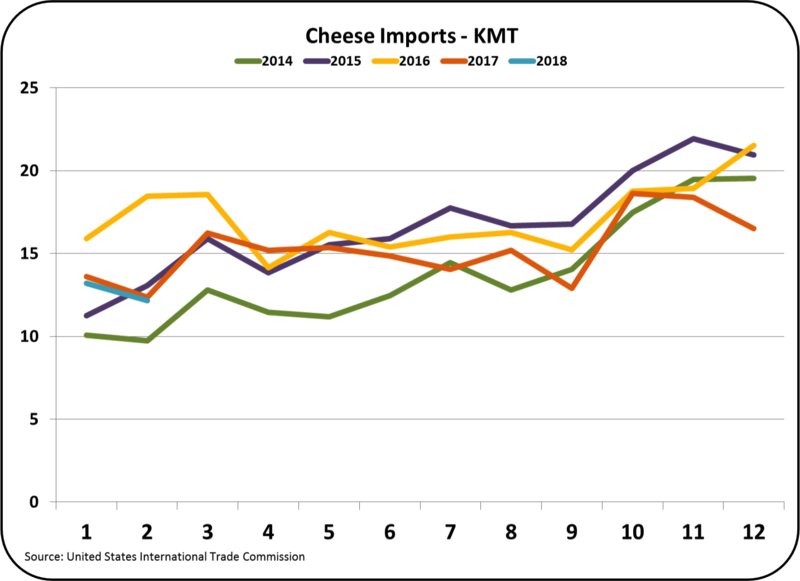 To get rid of the excess cheese inventories and allow producer prices to improve, significant gains in cheese exports are needed. Cheese imports, shown in Chart III, were also positive. 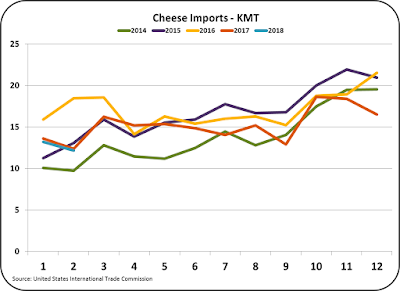 Less cheese was imported in February 2018 than the last four years. This is another positive, but small change. 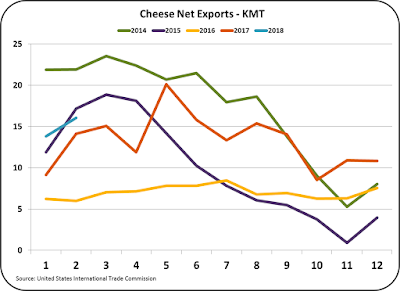 Aided by the combined increase in cheese exports and the decrease in imports, cheese net exports were near to the 2015 levels. 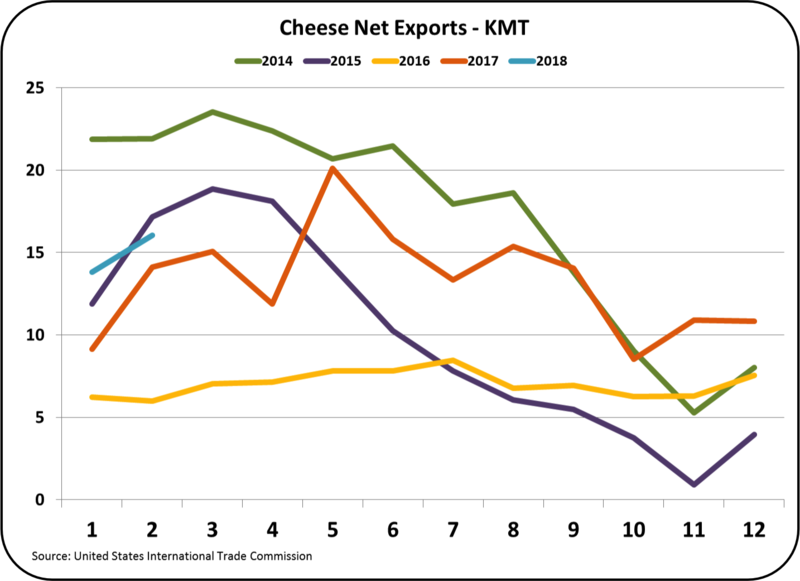 To reach the 2014 net export levels, cheese net exports must still grow by an additional 50%. With the already high export volumes, an increase of 50% is huge. The USDEC is the facilitator and their challenge is big, and very important to achieve. 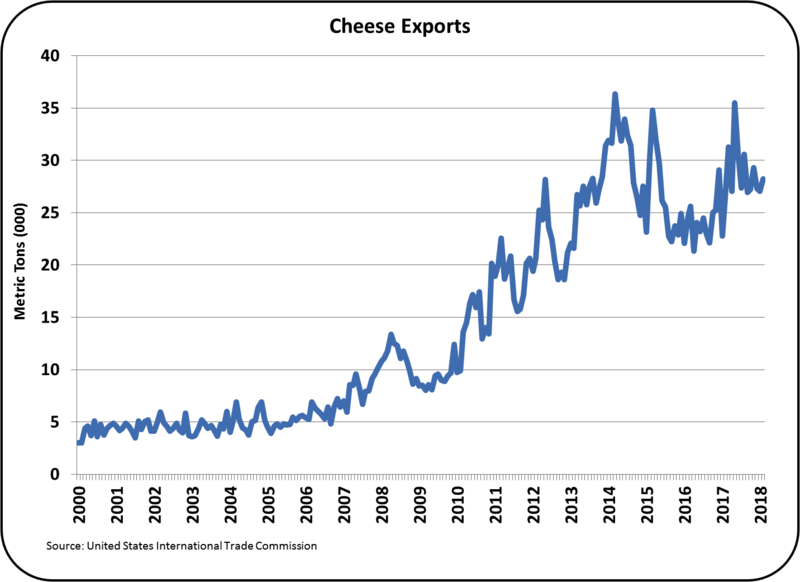 Why are cheese exports so important? By the formula shown below, it is easy to see why cheese prices are so important to the Class III milk price. 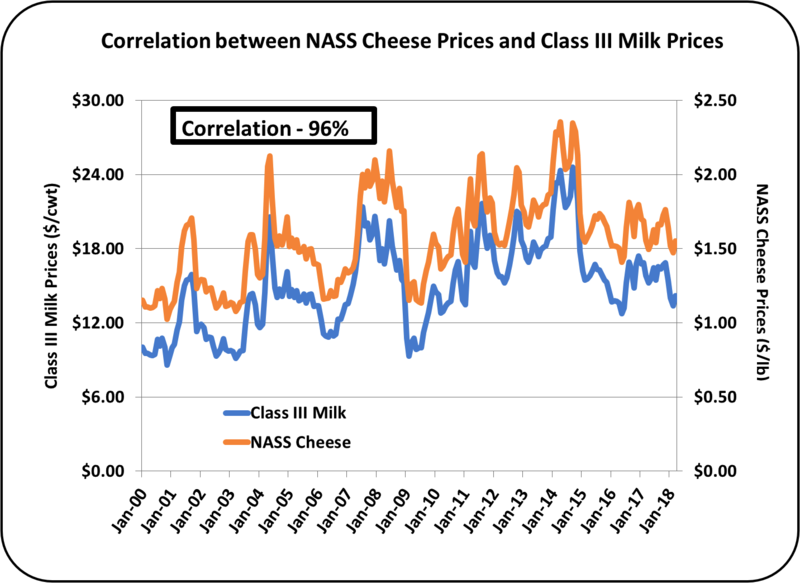 The correlation between the cheese price and the Class III prices is depicted graphically in Chart V below. 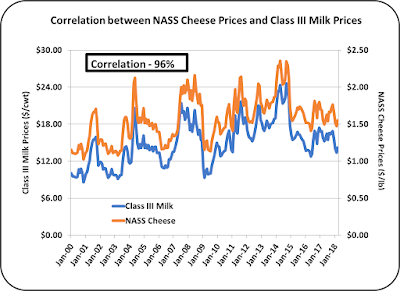 A correlation of 96% reflects a very tight relationship between the price of cheese and the Class III milk price. As goes the cheese price, so goes the producer milk price. The Class III price is also currently the basis for the Class I price. Class I milk and Class III milk combined make up the vast majority of the total producer milk. That means that the movement of the uniform producer milk price is all about the price of cheese. In the prior post, the extremely high inventory of NDM/SMP was covered. The export volume was equally notable. NDM/SMP exports were a record high, not just for the month, but an all time high. While international NDM/SMP prices are very low, and this is likely to continue, the U.S. was able to make significant volume gains in exports. Where is all this NDM/SMP going? The YTD growth is well spread among a number a nations. 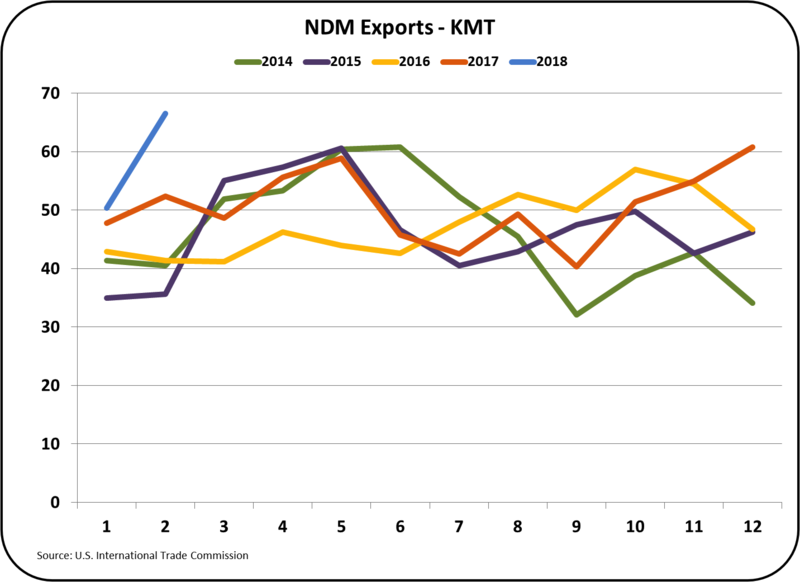 The vast majority of NDM/SMP exports go the Mexico and there is nice growth YTD. But there is also nice growth in exports to a number of other countries as shown in Chart VII. The title of this post is "Exports Continue to Show Progress." That really says it all. The growth in exports is positive, but even more growth is needed to match current milk production. Until equilibrium is reached, producer milk prices will continue to be low. Significantly increased exports and lower milk production are the only cures for the current glut of milk and the high inventories of dairy commodities. The March Class and Component Price Announcement, showed some nice improvement. Chart I below is positive for every dairy commodity except for Nonfat Dry Milk and Nonfat Solids. The Class III price gained $.82/cwt. over the prior month. This brought the Class III price to $14.22/cwt. While this is not a great price, it is a significant gain from the prior month. Milk Protein jumped 11.1%, on an increase in the cheese price of 5.5%. 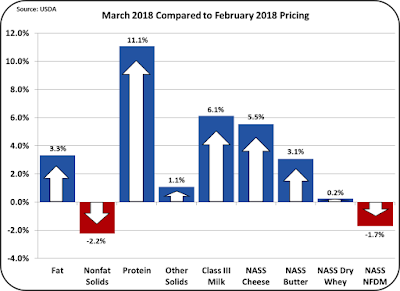 Milk protein is now worth $1.81/lb. 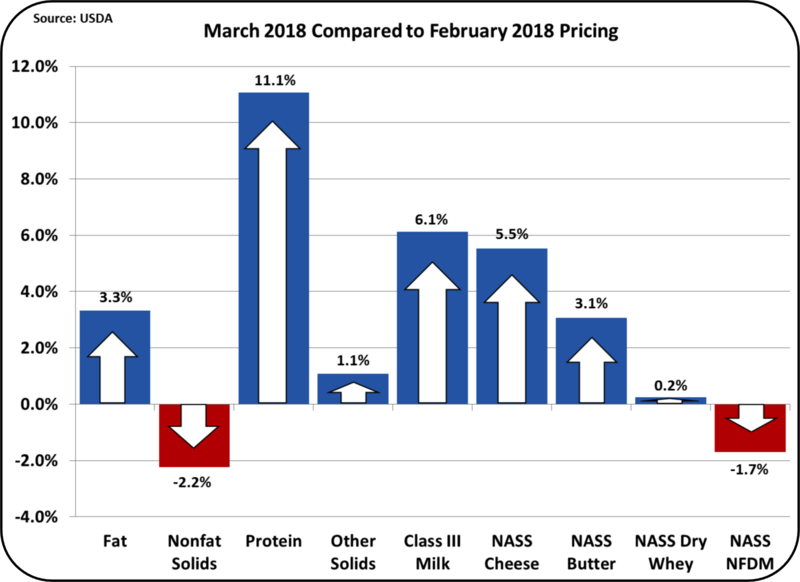 Butterfat had a smaller increase of 3.3% and is now worth $2.43/lb. Chart I - Pricing compared to the prior month. This still leaves a significant gap between the prices of cheese and butter. Traditionally, the prices of cheese and butter have been close with only short periods where one was significantly higher than the other (Chart II). The current price difference is a major change in the history of component milk prices. 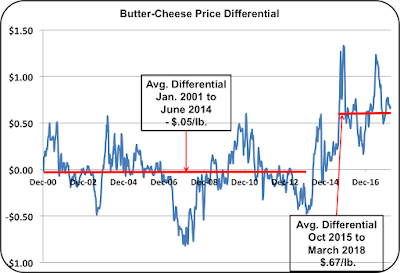 The differential between the cheese and butter prices over time is shown in Chart III. Between January 2001and May 2015 the average differential was - $.05/lb. (butter-cheese price). Cheese was slightly more expensive than butter. 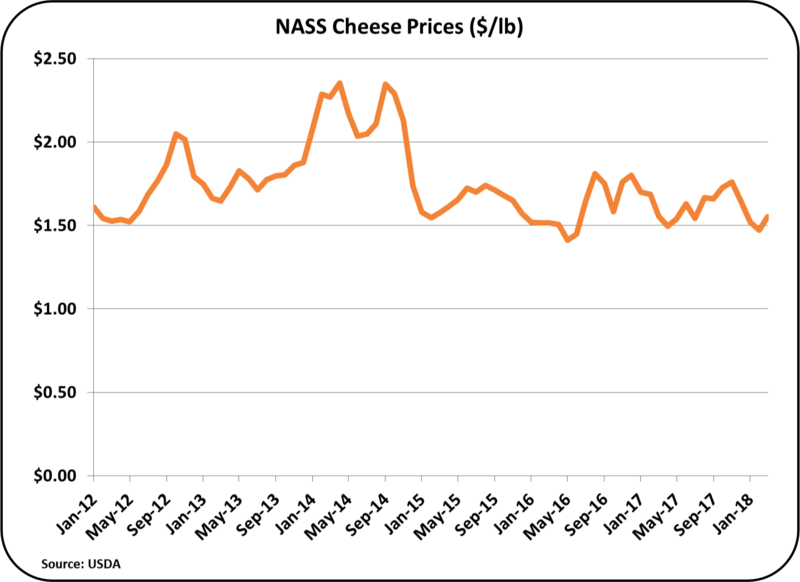 Between October 2015 and March 2018, the differential was a positive $.62/lb., a change of $.67/lb. 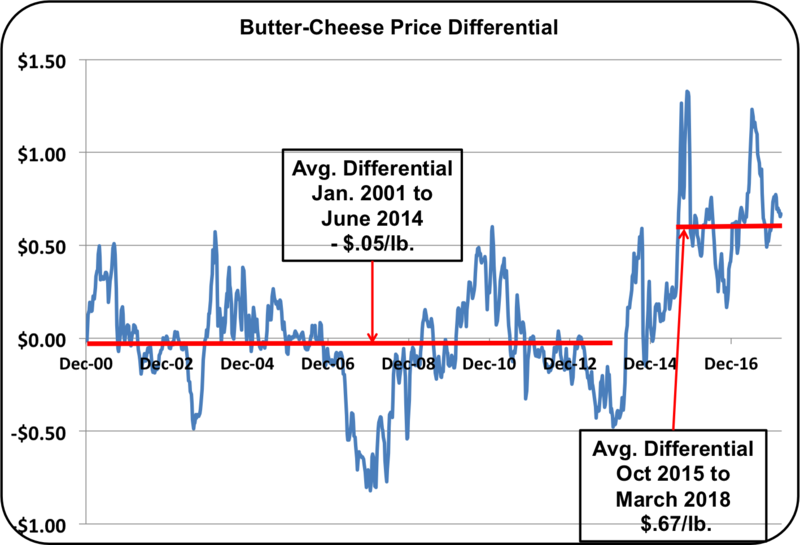 During the current three year time span butter has been significantly more expensive than cheese. This pricing difference between cheese and butter is now three years old, and can no longer be identified as a short-term aberration. The changing butter consumption was reviewed in the prior blog. Increased butter demand is putting pressure on supplies and stimulating imports of butter. Increased butter consumption is not just a U.S. trend. It is a global trend as well. The greater demand for butter creates a lot of milk with no butterfat. 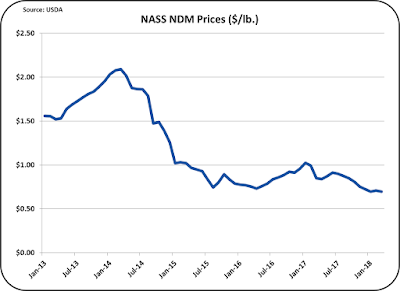 The financial impact on Nonfat Dry Milk/Skimmed Milk Powder (NDM/SMP) was mentioned in the prior post and analitics on this will be covered again below. 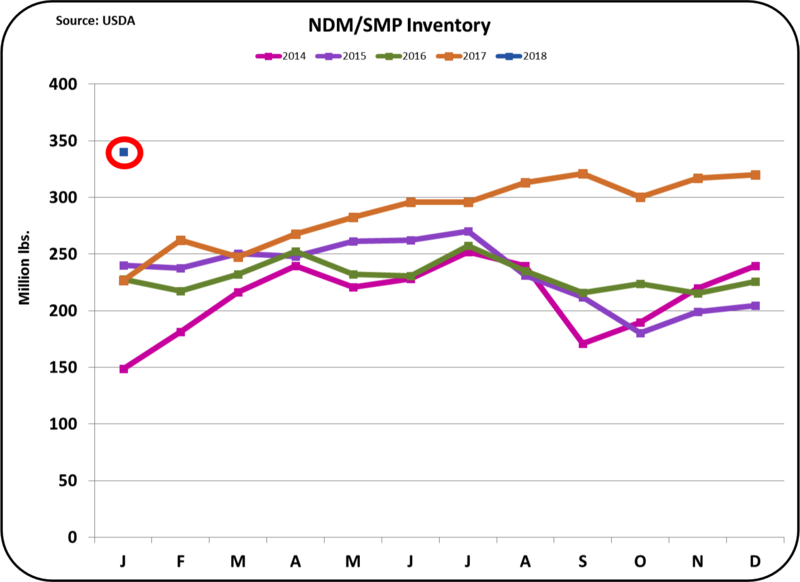 There is a very significant inventory glut of NDM/SMP, causing significant price declines. Cheese prices, which are the main determinant of producer milk prices, were up 5.5% from the prior month. 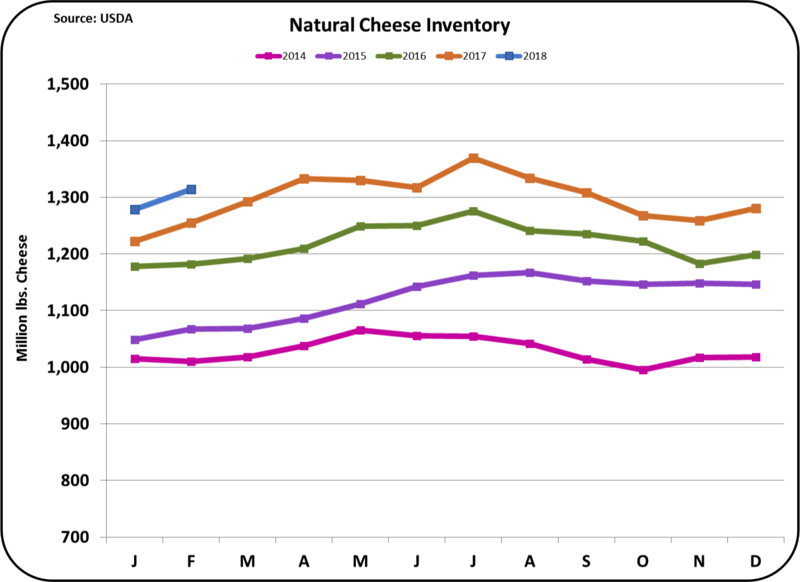 Inventories of cheese continue to grow as U.S. consumption and exports are outweighed by cheese production. 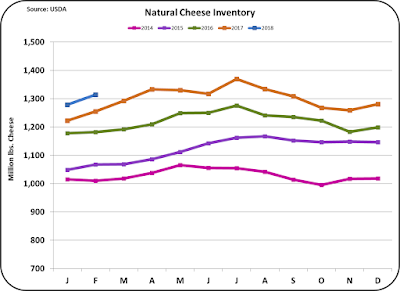 The bloated inventories (Chart IV) are keeping cheese prices low. 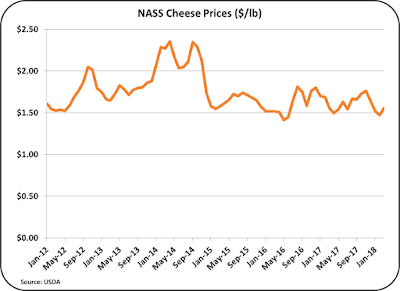 The current NASS cheese price is $1.55/lb., well below 2014 price of $2.35/lb. 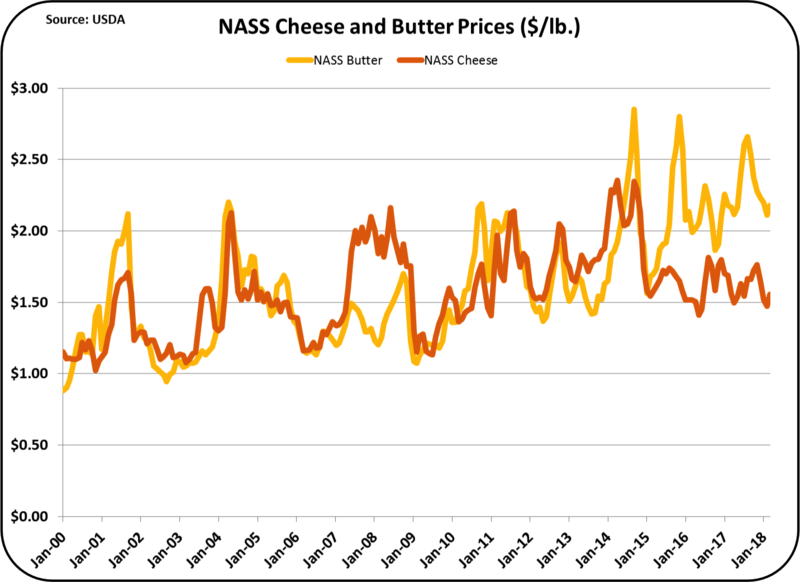 For the last four years, cheese prices have stayed between $1.50 and $1.81/lb. and they are currently near the bottom of that range. As mentioned in previous blog posts, less cheese needs to be produced and more cheese must be exported. 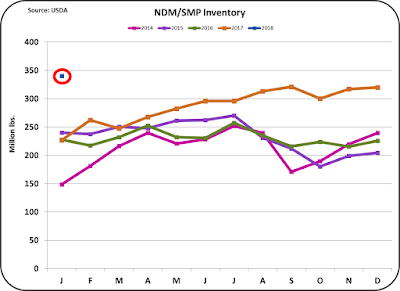 NDM/SMP inventories are very high (Chart VI). The majority of NDM/SMP is exported, linking the U.S. price to the global price. International prices are very low. 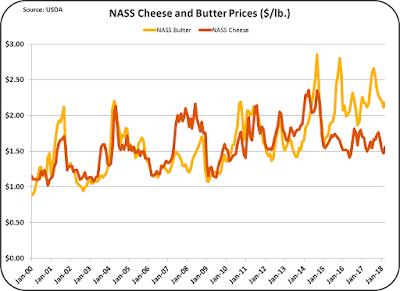 The demand for butterfat is and will continue to make more NDM/SMP available than there is demand for. This creates an over supply and puts pressure on the price of NDM/SMP. NDM is presently worth $.70/lb. Chart VII shows the impact of the NDM/SMP inventories on NDM/SMP pricing. The Price is very low and still in a decline. 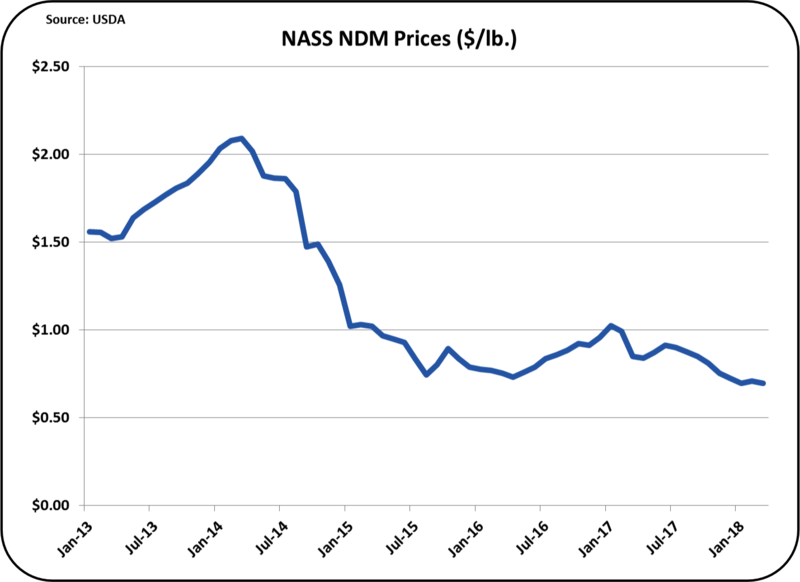 The NDM/SMP price is the basis for Class IV milk pricing, which is currently very low and will probably remain to be very low.